Blackstone Labs Orthobolic is a complex of the most effective active substances focused on reducing joint pain. The supplement does not only relieves pain but also promotes the regeneration of tissues forming joints and reduces inflammation. Joint pain is a common problem of physically active people. On one hand, resistance training supports the development of bones and increases their density. On the other hand, it is associated with the risk of damages to articular tissues. Practically, all elements forming diathrodial joints are exposed to strain and microdamages. Most of them contributes to reconstructing and strengthening tissues. However, the lack of the body’s regenerative capacity leads to the development of inflammation. This causes pain and next workouts contribute to developing and aggravating an injury. Palmitoylethanolamide (PAE) – this compound shows strong properties reducing pain, caused both by injuries and chronic diseases, and inflammation. Its action is based on two mechanims vital to functions of body cells. The first one involves the ability of palmitoylethanolamide to alter the activity of peroxisome proliferator-activated receptors. They regulate the expression of genes responsible for the process of inflammation, suppressing its reactions. What is more, PAE has an impact on the endocannabinoid system by stimulating cannabinoid receptors GPR55 and GPR119. As a result, it modulates neurosignalling by demonstrating a strong analgesic effect which is comparable with the one produced by the popular anandamide. Cissus Quadrangularis – a plant with strong anti-inflammatory and analgesic properties which refers especially to articular tissues. In terms of efficacy, it is compared to non-steroid anti-inflammatory drugs, but it has no side effects. Its action is based on the ability to inhibit many mechanisms promoting inflammation and nociception. The most important one consists in blocking the metabolism of arachidonic acid, which is a substrate for cyclooxygenases COX-1 and COX-2. Both of them are enzymes stimulating the development of inflammation. Apart from that, cissus quadrangularis shows the ability to inhibit the synthesis of osteoclasts whose task in the body is to reduce bone cells. Consequently, the plant boosts bone density which has a positive impact on mechanical resistance and post-injury recovery. Boswellia Serrata – a plant which produces resin with exceptional properties, known as olibanum. It is mentioned several times in the Bible and is used for producing natural incense. It is used in the Eastern medicine as a medicine for different aliments of the locomotor system. It enhances the immune response, stimulates regeneration processes and promotes the reconstruction of connective tissue. It has also an analgesic effect and provides effective support for the treatment of rheumatic diseases. Curcumin – a popular food colouring which shows a beneficial impact on the body’s regeneration processes. Owing to the ability to inhibit the synthesis of NF-kB protein, it has immunomodulatory properties, strengthens the immune response and shortens the duration of inflammation. It is especially effective for the treatment of rheumatoid arthritis. Studies report also a reduction in symptoms of arthritis due to curcumin supplementation. Furthermore, it exhibits an antibacterial and antiviral effect, is a strong antioxidant and has anticancer properties. Due to its problematic bioavailability, it is found in the supplement in combination with piperine. It has been demonstrated that it improves significantly curcumin absorption. UC-II (UNDENATURED TYPE II COLLAGEN) – a patented formula of non-processed collagen derived from chicken sternum cartilage. It demonstrates the highest bioavailability in the human body. It contains constitutent amino acids typical of collagen, hereby providing the building block for endogenous synthesis of this protein. It is a key component of connective tissues and its deficiencies contributes to increasing susceptibility to injuries and functional disorders of the locomotor system, including limited mobility of joints. Collagen supplementation has a positive effect not only on building blocks of the skeletal system but also influences mechanical resistance of muscles and skin quality. 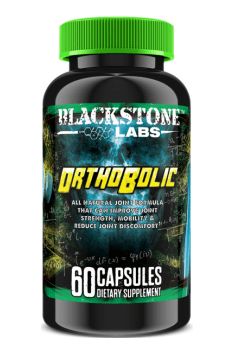 To sum up, Blackstone Labs Orthobolic is an advanced formula which is a remedy for joint-related problems. The product should be taken both by sufferers of painful ailments of the osteoarticular system and all hard training athletes. The supplement will help enhance the endurance of bones and soft tissues, reducing the risk of injuries. It can also increase mobility, which may be a biochemical factor in limiting normal motor patterns in many training individuals. Take 2 capsules of Orthobolic once per day with a glass of water. The supplement should be used as a preventive measure, especially during strength training. It is characterised frequently by maximum intensity when it is practically impossible to do exercises perfectly. The preparation will strengthen supporting structures of joints, reducing the risk of strain injuries caused by the lack of technique.